George Glenn Strange (August 16, 1899 – September 20, 1973) was an American actor who mostly appeared in Western films. He is best remembered for playing Frankenstein's monster in three Universal films during the 1940s and for his role as Sam Noonan, the popular bartender on CBS's Gunsmoke television series. Strange was born in Weed, New Mexico Territory, 13 years prior to New Mexico gaining statehood. He was the fourth child of William Russell Strange and the former Sarah Eliza Byrd, an eighth generation grandson of Pocahontas and John Rolfe. He was of Irish and Cherokee descent and was a cousin of Western film star and narrator Rex Allen. Strange grew up in the West Texas town of Cross Cut. His father was a bartender and later a rancher. Strange learned by ear how to play the fiddle and guitar. By the time he was 12, he was performing at cowboy dances. By 1928, he was on radio in El Paso, Texas. He was a young rancher, but in 1930, he came to Hollywood as a member of the radio singing group Arizona Wranglers. Strange joined the singers after having appeared at a rodeo in Prescott, Arizona. In 1932, Strange had a minor role as part of the Wrecker's gang in a 12-part serial, The Hurricane Express, starring John Wayne. He procured his first motion picture role in 1932 and appeared in hundreds of films during his lifetime. He played numerous small parts in Paramount's popular Hopalong Cassidy film series, usually cast as a member of an outlaw's gang and occasionally as a local sheriff. Beginning in 1949, he portrayed Butch Cavendish, the villain responsible for killing all of the Texas Rangers except one in the long-running television series The Lone Ranger. Strange appeared twice as Jim Wade on Bill Williams's syndicated western series geared to juvenile audience's The Adventures of Kit Carson. He also appeared twice as Blake in the syndicated western The Cisco Kid. In 1952, he was cast in the role of Chief Black Cloud in the episode "Indian War Party" of the syndicated The Range Rider. In 1954, Strange played Sheriff Billy Rowland in Jim Davis's syndicated western series Stories of the Century. Strange appeared six times in 1956 in multiple roles on Edgar Buchanan's syndicated Judge Roy Bean. In 1958, he had a minor part in an episode of John Payne's The Restless Gun and had an important role in the 1958 episode "Chain Gang" of the western series 26 Men, true stories about the Arizona Rangers. That same year he played the rancher Pat Cafferty, who faces the threat of anthrax, in the episode "Queen of the Cimarron" of the syndicated western series, Frontier Doctor. Strange appeared in six episodes of The Rifleman playing the same role in different variations: Cole, the stagecoach driver, in "Duel of Honor" (episode 7); a stagecoach shotgun guard in "The Dead-eye Kid" (episode 20); Joey, a stagecoach driver, in "The Woman" (episode 32); as well as an unnamed stagecoach driver in "The Blowout" (episode 43), "The Spiked Rifle" (episode 49) and "Miss Bertie" (episode 90). Strange was cast in five episodes of the ABC western The Life and Legend of Wyatt Earp and three segments of the syndicated Annie Oakley. In 1959, he appeared in another western syndicated series, Mackenzie's Raiders, in the episode entitled "Apache Boy". Strange first appeared on Gunsmoke in 1959 and assumed several roles on the long-running program before he was permanently cast as the stolid bartender. Strange was cast twice on Kirby Grant's western aviation adventure series, Sky King, as Rip Owen in Stage Coach Robbers (1952) and as Link in Dead Giveaway (1958). In 1942, he appeared in The Mad Monster for PRC, a poverty row studio. In 1944, while Strange was being made up for an action film at Universal, make-up artist Jack Pierce noticed that Strange's facial features and 6'5" height would be appropriate for the role of Frankenstein's monster. 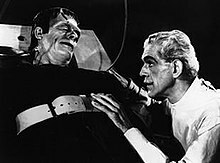 Strange was cast in 1944 film House of Frankenstein in the role created by Boris Karloff in Frankenstein (1931), coached by Karloff personally after hours together. Strange recounted a personal anecdote in Ted Newsom's documentary, 100 Years of Horror (1996). On the set of House of Dracula (1945), Lon Chaney, Jr., got him extremely inebriated. In the scene in which the Monster is discovered in a cave, where Strange lay immersed for hours in "faked quicksand" (actually cold mud) waiting for the cameras to roll. As Glenn began to get a serious chill, Chaney recommended that alcohol would keep Strange warm. Strange could barely walk straight after the day's shooting. 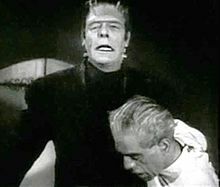 Strange played the Monster a third time in Abbott and Costello Meet Frankenstein (1948), with Chaney, Jr. as the Wolf Man and Bela Lugosi as Count Dracula. Strange also appeared in character with Lou Costello in a haunted house skit on The Colgate Comedy Hour as well as making a gag publicity appearance as a masked flagpole-sitter for a local Los Angeles TV show in the 1950s. After weeks of the station teasing the public about the sitter's identity, Strange removed his mask and revealed himself as Frankenstein's monster (actually, yet another mask.) Strange also played a monster in the Bowery Boys horror-comedy Master Minds in 1949, mimicking the brain-transplanted Huntz Hall's frantic comedy movements, with Hall providing his own dubbed voice. During the wave of monster-related merchandising in the late 1950s and 1960s, it was usually Glenn Strange's iconic image used for the Monster on toys, games and paraphernalia, most often from his appearance in the Abbott & Costello film. In 1969, The New York Times mistakenly published Boris Karloff's obituary with Glenn Strange's picture as the Frankenstein monster. Strange was 6 ft 5 in tall and weighed 220 lbs. His first wife was Flora Hooper of Duncan, Oklahoma. They had two daughters, Wynema and Juanita. He was married from 1937 to his death in 1973 to his third wife, Minnie Thompson (1911–2004). The couple had two children, Harry Glenn Strange (born 1938) and Janine Laraine Strange (born 1939). On September 20, 1973, at age 74, Strange died of lung cancer in Los Angeles, California. Singer Eddie Dean, with whom Strange had collaborated on various songs and opening themes for films, sang at Strange's funeral service as a final tribute. Strange is interred at Forest Lawn - Hollywood Hills Cemetery. In 1975, two years after Strange's death, his Gunsmoke costar Buck Taylor named his third son Cooper Glenn Taylor after Strange. ^ a b Raw, Laurence (2012). 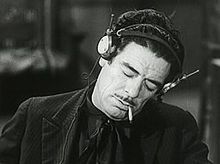 "Glenn Strange", Character Actors in Horror and Science Fiction Films, 1930–1960 (Jefferson, North Carolina: McFarland & Company, 2012), p. 175. Retrieved October 29, 2017. ^ Hathorn, Billy (2013). "Roy Bean, Temple Houston, Bill Longley, Ranald Mackenzie, Buffalo Bill, Jr., and the Texas Rangers: Depictions of West Texans in Series Television, 1955 to 1967", West Texas Historical Review (Abilene, Texas: West Texas Historical Association, 2013), Vol. 89, p. 103. ^ "Secrets Of TV's The Rifleman: More Than Just Guns And Good Times: Stagecoach Driver (Glenn Strange)", TrendChaser. Retrieved February 22, 2019. ^ Mank, Gregory William (2009). Bela Lugosi and Boris Karloff: The Expanded Story of a Haunting Collaboration (Jefferson, North Carolina: McFarland & Company, 2009), p. 610. ISBN 0-7864-3480-5. ^ "Glenn Strange, Actor, Dies; Was ‘Gunsmoke’ Bartender", digital archives of The New York Times, September 22, 1973. Retrieved February 23, 2019. Wikimedia Commons has media related to Glenn Strange. "United States Social Security Death Index," database, FamilySearch (https://familysearch.org/ark:/61903/1:1:JT41-TQ9 : 19 May 2014), Glenn Strange, Sep 1973; citing U.S. Social Security Administration, Death Master File, database (Alexandria, Virginia: National Technical Information Service, ongoing).